Like Ned Kelly, Steve Hart was the son of Irish immigrants. After befriending the Kelly brothers he took part in the bloody siege at Stringybark Creek and was declared an outlaw. 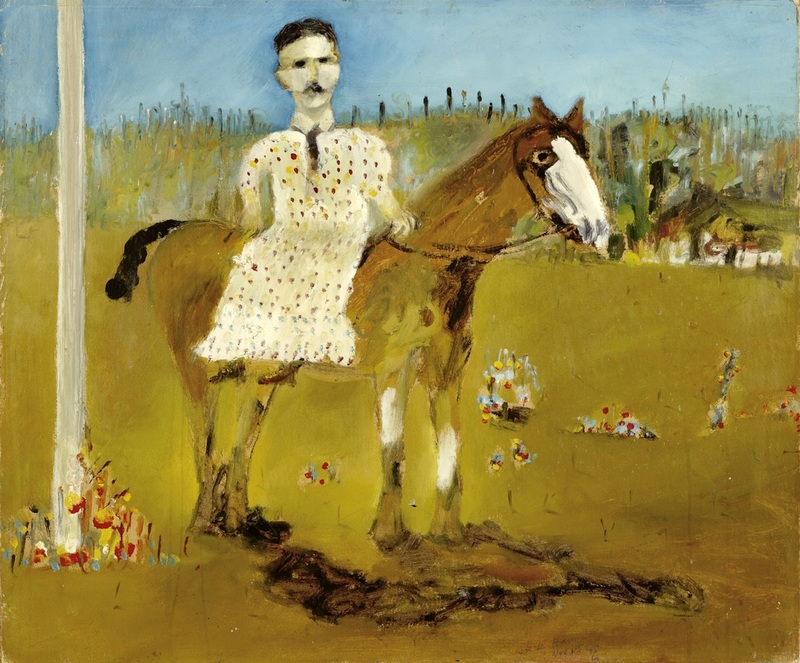 Hart was known for his horsemanship, and in this work he is depicted riding side-saddle on a horse, clad in a spotted dress. Much has been written about Nolan’s depiction of Hart apparently cross-dressing (see for example, Peter Carey’s, The History of the Kelly Gang). According to Nolan, Hart dressed in feminine attire merely to deceive the police, and his disguise was purportedly so effective that the police thought he was one of the Kelly sisters. Here, he is shown quite composed, calmly staring out at the viewer. This work was a study for a later work entitled Steve Hart dressed as a girl (1947).